Today, Kabam will release its latest MMORPG, Wartune: Hall of Heroes, for iPhone, iPad and iPod touch devices in addition to Google Play mobile devices and tablets. 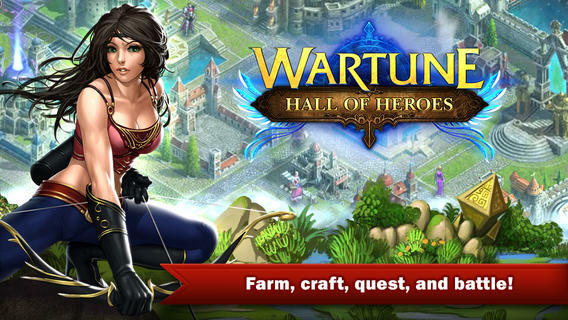 Wartune: Hall of Heroes, which quickly became a top 10 grossing app shortly after launching in China from 7Road and Hoolai of Beijing, is a mobile extension of the same title currently available to play on the web at Kabam.com, launching with a range of gaming experiences previously only seen with PC and console-based games. Wartune: Hall of Heroes has been significantly retooled for mobile platform support to ensure players have the same experience on mobile devices as those using laptop or desktop computers. The latest mobile hit from Kabam allows players to immerse themselves in a fantasy world in either a solo campaign mode, or by joining other players in various PvP events ranging from three-person squads up to 30-member guild battles. With a deep storyline and compelling mobile graphics, Wartune: Hall of Heroes invites new players to join hundreds of other Knights, Mages and Archers already unlocking epic gear and leveling up their heroes, to fight simultaneously to defeat enemies, quest for territory and treasures and explore the immersive fantasy world before them.